For the last few years I’ve struggled with the daily practice of words, so much so that it’s often been monthly or yearly practice. It coincides precisely with having a child, and being pulled inside out to live in the physical world, and so discovering that I am not one of those people who can effortlessly slip from the timetabled daily experience of feeding a baby into the frothy netherworld that is my imagination. No sir. I’ve been searching for ways and means to grease the wheels and unexpectedly found another one: colouring in. I was reading the inspiration issue of Poets & Writers, which includes an article on the science of the writer’s brain, and the way our perceptions of failure and threat can cause excessive stress hormones, and these in turn cause us to sit staring at a blank screen. There’s a whole book on the subject, if you’re interested: Around The Writer’s Block: Using Brain Science to Solve Writer’s Resistance, by Roseanne Bane. One of the solutions is to cultivate a habit of ‘process’, which means doing something that gets your creative blood flowing without consequence. Something you don’t have to share, work on, or edit in other words, and if you’ve ever done Julia Cameron’s Morning Pages, that’s exactly the idea behind them. Bane suggests using other kinds of artistic activities, like sketching, dancing, listening to music or drawing mandalas as well. 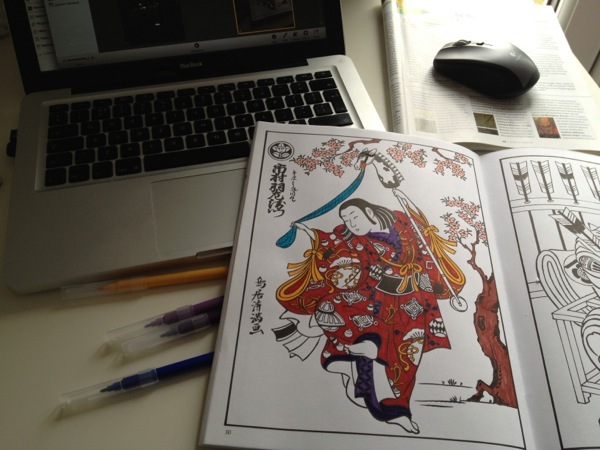 Which is how I found myself colouring in thirty or so sakura flowers last week. We already had felt tips bought from the Tate, and a Dover colouring book given to us by friends, and so I sat down and started to colour. It’s a book of Japanese illustrations, and so is full of intricate patterns and fiddly bits, and after about five minutes my brain stopped screaming about when I was going to do something “useful” and instead started thinking about which colour I was going to do next. For fifteen minutes I was lost in the drawing. You know, like a kid. You remember that feeling, don’t you? Colouring in pattern wheels, or painting by numbers, just enough for the hands to do, but not too much brain involved. It’s worth a try if you’re having a tough time getting to the words (or whatever creative pursuit you do), and if you have any other way of greasing your wheels, I am utterly open to suggestion.